Custom Wood Cabinets in El Paso | Eleganzza Granite Inc. Custom Wood Cabinets in El Paso | Eleganzza Granite Inc. In addition to providing countertops and granite slabs to the Southwest area, Eleganzza Granite Inc. also provides cabinet contracting and installation services. When it comes to deciding on the perfect cabinets for your kitchen, it’s best to understand what’s available to you. 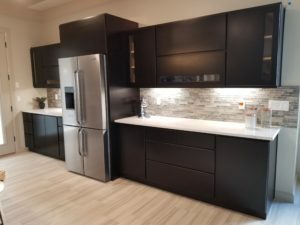 We offer a variety of wood cabinets and can also take your ideas into mind in order to design custom cabinets that will transform your kitchen from common to extraordinary and original. Cabinets made from this type of wood are well known for their red undertones, smooth appearance and uniform texture. Cabinets can come in a variety of colors, from white to rich brown. Lighter in color than cherry wood, maple cabinets boast a dignified grain pattern which produces a uniform appearance. A more colorful option, oak wood cabinets can manifest streaks of green, yellow and black. Mineral deposits in the wood itself are responsible for these original colors. For an even-textured grain, consider alder wood cabinets. This option is well known for its light brown coloring and reddish undertones. This option is easily distinguishable due to its naturally contrasting appearance. The color of hickory wood ranges from white to dark brown. The surface texture of this option is smooth and boasts a tight, strong, and heavy wood grain. Sapwood colored birch is lighter while heartwood resides on the darker end of the color spectrum. The smooth lines found in this type of wood make it an excellent option for homeowners who are looking for uniform and organized patterns in their kitchen cabinets. Colors may range from dark, chocolate brown to light red. Another option ranging in colors from light blonde to dark brown, pecan wood cabinets boast dramatic colors that will stand out in any kitchen. 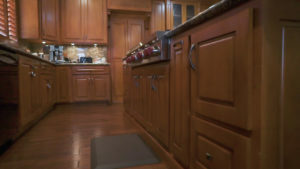 Even though there are many wood options available, Eleganzza Granite Inc. is able to provide custom cabinet services to homeowners in the El Paso area. This means that we’ll be able to create what you have in mind. Since we work with talented designers, we are able to create a product that looks beautiful and works as its meant to. Contact Eleganzza Granite Inc. today to learn more about what we have to offer!